It is very close to commercial center, just few minutes walk to the business and government quarters and 10 minutes to the legendary Hoan Kiem Lake. 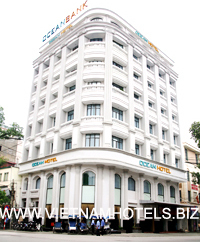 Its40 rooms and suites are sound proof, tastefully designed, well equipped with international standard facilities which discerning business and leisure travelers expect in their new-found home in Hanoi. Be in a spacious and comfortable twin-bed or double - bed and obtain utmost satisfaction. With separate living room and large working table, it provides comfort and enjoyment. Its jacuzzi invitingly sooths your body with hot bath. - Well stocked mini-bar. IDD. - Complimentary tea/coffee making facilities. - Color TV with satellite system. The Park View Restaurant is set in elegant yet relaxed surroundings. Open daily from 6:00 am to 11:00 pm every day. This cozy hideaway, offers seasoned travelers and business executives the perfect venue to meet friends and business associates in a refined and intimate atmosphere. Combined with wines and cocktails from around the world with music. This restaurant makes for a wonderful place to relax. oA snack menu is available at the Lotus Bar throughout the day. Both of Park View Restaurant & Lotus Bar equipped for WiFi High Speed Internet Access.